I’m much, much too old to have encountered the works of R L Stine as an impressionable nipper, so I couldn’t say how faithful this take is to the spirit of his work. I’d hazard, though, that it has veers to just about the right sense of humour but lacks the personality. Probably unsurprisingly, since it’s helmed by Rob Letterman, responsible for such DreamWorks Animation trifles (even by their standards) as Shark Tale and Monsters vs. Aliens. 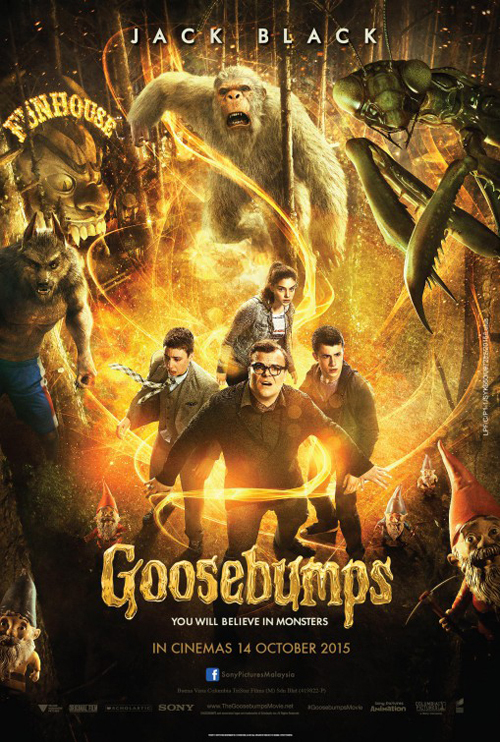 He made his live action debut with the execrable Gulliver’s Travels, so when I say Goosebumps is his best movie to date, it’s very much a relative appraisal. This is also Letterman’s third teaming with Jack Black, who at least comes out reasonably well, cast both against type as an uptight, crotchety parent, an entirely fictional personification of Stine, and simultaneously very much in-type as a very shouty fellow. Yes, curiously given the vast numbers of books Stine has written (more than 60 in the main Goosebumps series), Sony chose not to adapt any of them per se, perhaps because they already found a more suitable home in a ‘90s anthology series. On the big screen front, Tim Burton came and went as director (throw a rock drenched in eyeliner and a fright wig and it’s bound to hit any given children’s fiction property), and then Scott Alexander and Larry Karaszewski (Ed Wood, The People vs. Larry Flynt, and the recent American Crime Story) came on board, ultimately being rewritten by Darren Lemke. The result is a mish-mash of vaguely familiar family movie ideas and mild horror tropes, most obviously the Jumanji premise of innocuous objects giving life to a menagerie of monsters and characters (there from a board game, here from Stine’s books). Black obviously likes the general premise, as he’s signed up to the Jumanji sequel (not, Dwayne Johnson informs us, a remake). We’ve had numerous movies revolving around an author’s uncanny encounters (mostly sourced from Stephen King) and even a few where characters leap off the page (In the Mouth of Madness springs to mind), although the conceit of writing one’s way out of certain doom is probably most recognisable from Inkheart (and, to fans, from Doctor Who’s The Mind Robber). The young leads all turn in acceptable work, led by Dylan Minette as the town newcomer and Odeya Rush (a younger Mila Kunis, but with more personality) as Stine’s daughter, with Ryan Lee as the suitably aggravating, over-excited best friend (in particular, Lee makes a good foil for the abrasive Black). Amy Ryan has a nothing role as Minette’s mum and Jillian Bell is annoying as his aunt, but she seems to make that her calling card. If the plot runs an unremarkable gamut (released creatures must be returned to their tomes), there are some quirky incidentals and occasionally risqué gags (“I didn’t know being an audiophile was a crime” Stine protests to an over-excitable police recruit; “Your incredibly reckless driving saved all our lives” Bell is told). There are also frequent allusions to Stine’s incredibly prolific output and success, such that he continually cites his book sales (400m worldwide!) and is unclear about what exactly he’s created (“I don’t remember writing about a giant praying mantis”). But the picture is merely good, lively fun, never extending itself to the kind of lasting status a craftsman like Spielberg or Dante would have lent it. Indeed, it has the tone of an Amazing Stories episode, or similar ‘80s fare, but feels as if it has been made in the full awareness that it will be forgotten about five minutes after it’s over. I don’t think we’re going to see 60-odd Goosebumps movies.